1) The contest is open to all professional cartoonists, caricaturists, illustrators and graphic artists from all over the world. B) Caricature (caricature means a parody portrait of a well-known character. It is mandatory to mention also the name of the caricature character. Each participant can submit up to three works for each section, specifying the title. 3) Theme: The Sixties. Years of great social, historical and cultural ferment. The authors can freely draw inspiration from events, facts or characters that have marked this era: music, the Beat Generation, student revolutions, the economic boom in the West, the crisis in Cuba, the Vietnam’s War, scientific discoveries and the conquest of the Moon, only to suggest some. 4) The works must be UNPUBLISHED, accompanied by the participation card, biography and photo. 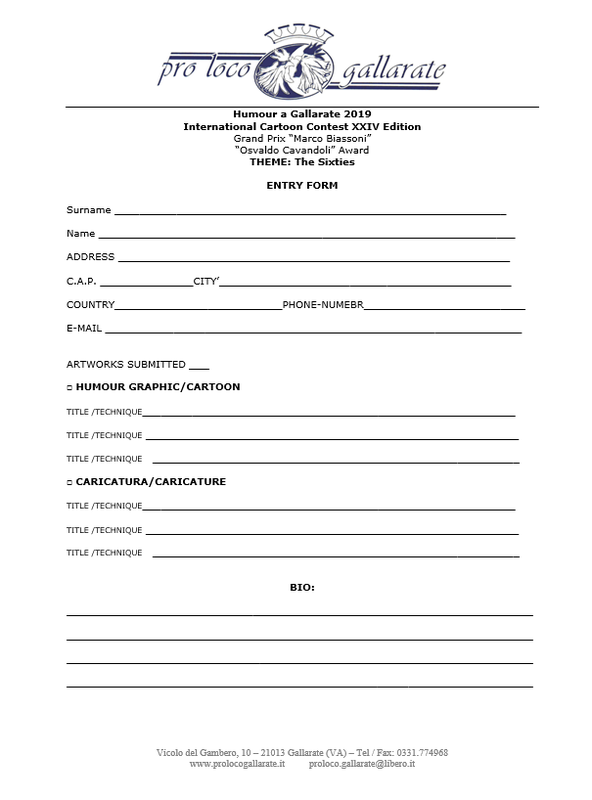 Any work already published on paper or on the web will automatically be excluded from the assignement of prizes. 5) Size: A4 (cm 21 x 29,7). The artworks can be made with any technique, including digital techniques. B) Electronic submission: The file must include the author's name and the progressive number (example: COUNTRY_surname-name01.jpg, COUNTRY_surname-name.jpg, etc). File format: JPG, 300 DPI, Max 2MB for each image. IMPORTANT: To all award winners is required to send the original work that will become part of the "Humor at Gallarate Collection". In case of digital artwork, the author is required to send a high-definition print with the "unique copy" caption and signed. 8) Deadline. 12.00 pm May 31st, 2019. - “Cava Award”: 500 € + diploma. The special "Cava Award" named after Osvaldo Cavandoli, creator of the celebrated "La Linea" character, will be assigned to the artwork, chosen from all the sections, that will combine best the beauty of humorous, satirical or caricatural content with the essence of the core graphic execution. 10) Jury: The selection of works and the awarding of prizes is exclusive jurisdiction of the Jury, appointed by the Pro Loco Gallarate, which will meet in June 2019, in Gallarate. Opening and award ceremony: saturday June 29th, 2019, at 5 pm, Sala degli Arazzi – Missoni, Museo MA*GA, Via Egidio De Magri, 1 Gallarate. After the ceremony maxi risotto with Pro Loco Gallarate and 1998 World Guinness Records Pan and concert outside the Museum, in the anfitheater. 12) Catalogue: Each selected author, exhibited in shows and published in the catalog, will receive a complimentary copy of the same. 13) Property and copyrights: Organizers reserve the rights to reproduce the cartoons in catalogue, newspapers, or posters to promote the Contest and to exhibit a selection of works in other locations in Italy or other countries. None of works will be returned but will be included in the "Humour Gallarate Collection". By submitting the artworks, the author accepts the rules and regulations of the Contest and the decisions of the Jury. 0 Response to "XXIV International Cartoon Contest Humour a Gallarate 2019, Italy"